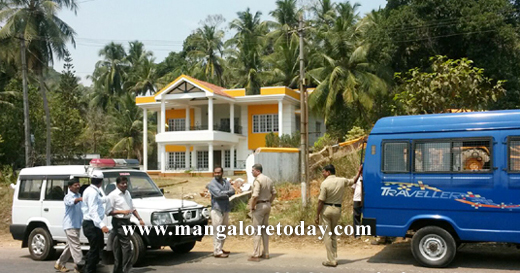 Bantwal, March 8, 2016: The Mangaluru City Corporation came under fire from angry villagers of Thumbay on March 7, Monday for demolishing the compound walls of three houses in the village, without any prior notice. Compound walls belonging to Arif, Ashraf and Manorama were demolished as they stood over the water pipeline leading to Mangaluru. The protestors charged the MCC of behaving in an autocratic manner and demolishing the compound walls without even bringing the matter to the notice of the local Gram Panchayat . The angry villagers gathered in front of the water treatment plant and staged a protest. Earlier, the protestors who took out a procession from Thumbay Junction arrived near the plant and even shouted slogans against the authorities. Padmanabha Kottari, former MLA, Ganesh Suvarna, Thumbay Gram Panchayat President, Praveen B, former president and many others participated in the protest. The notice had to be issued by the MCC against this. The MCC cannot be so irresponsible.